Packing for any trip can send me into a frustrated and confused state where procrastination sets in and the packing task gets dragged out into an abyss of nothingness until I am rushing like crazy throwing random pieces into a bag. If like me you are a Virgo, or you like to be organised and loathe thinking about what to pack, then a packing list is a must before any trip. I started writing and using packing lists after a high school trip that I took with my best friend when I was about 17. I had very little cash for the trip and when I showed up I realised I didn’t pack any spare underwear. For the next fortnight I was washing daily and alternating 2 different swimmer/bikini bottoms with my single pair of undies and it’s safe to say….it’s a lesson learnt. I’ve recently been travelling interstate quite frequently for short stays of 3-4 days. 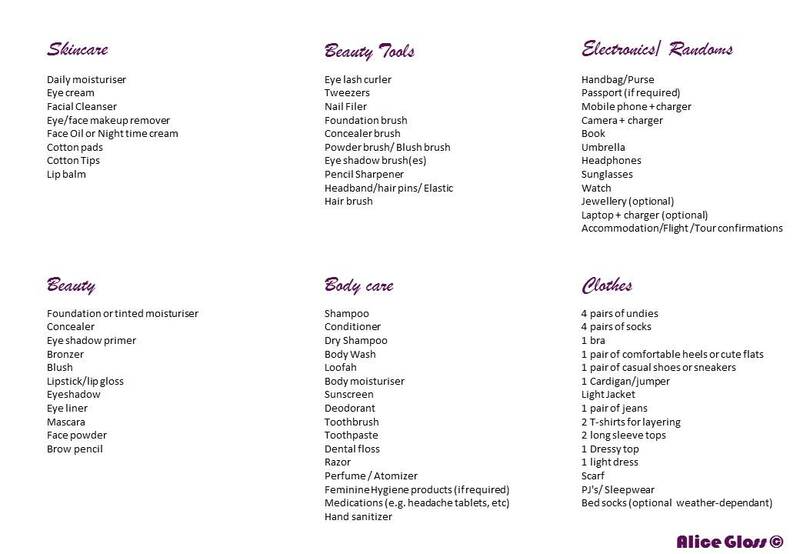 I put together a little packing list covering clothes, shoes, skincare, beauty (of course!) and the boring but necessary bits for a city break during Autumn/Fall. When travelling to a city it doesn’t really matter if you forget something as you can always pick up what you need when you are there. However, since I am super-pedantic and like to be prepared, I opt for using a guide for packing. We have really been enjoying taking along just a carry-on bag on our trips. It feels quite freeing not having to lug around half your life in a suitcase and waiting at baggage collection for the hoard to arrive. However, if you are used to larger suitcases, then carry-ons require careful planning to make the most out of the limited space you have. It is always handy to check the weather forecast for the duration of your stay in advance to ensure that you pack the right clothes. There’s nothing worse than arriving at your destination only to realise you are too cold or too hot and have nothing appropriate to wear. Some tips on skincare – always decant skincare into smaller bottles for short stays. You can get excellent little plastic bottles in the beauty section of most stores. Full-sized bottles of skincare just take up valuable carry-on bag space that can be better utilised. I try to keep sample sizes of products to take with me on trips and use products that can multi-task. A good one is Bioderma Micellaire water, which is both a great eye-makeup remover as well as a face makeup remover. Perfume bottles tend to be quite heavy and take up too much space. I recommend using a perfume atomizer, as this is the best way to take your favourite fragrance with you on your trip and carry it around in your handbag for quick touch-ups. When on a short break you don’t want to spend your time fuffing about for ages applying your makeup. You want to get out and explore! I opt for multi-purpose items and recommend products like the Stila convertible colour for a cheek and lip tint for example. Also, YSL do a nice product called ‘Kiss & Blush’, as the name suggests – for your pout and cheeks. Alternatively, you can use a lipstick as a blush by using your index finger to dab it onto the apples of your cheeks and blending it out with a clean finger – using the same lip and cheek colour helps to tie the makeup look together. Also, I love using a bronzer not only to bronze my face but also to double as an eyeshadow. Use as many creamy products that can be applied with your fingers as possible, to help to speed up the ‘getting ready’ process. Packing clothes and shoes is an art. The art of rolling your clothes is best to save on space, and stuffing your shoes with your socks and undies is instrumental in holding their shape and not getting destroyed in your luggage. Organising what you plan to wear and wearing your big ticket items on the journey, like a jacket or jumper, also helps to also save space in your luggage. Pack light with all your might and enjoy happy travels! < Previous Rushed? Here’s a 5 minute Fresh & Natural Spring Look That’ll Get You Cleaned Up Quick!